It’s a fact: pic­tures speak to us in ways that words nev­er will, right? Images tell sto­ries; they cap­ture our imag­i­na­tion, and entice us to engage in ways that words often don’t. If you agree with me in the­o­ry, but are stumped as to exact­ly how and where to start with build­ing rela­tion­ships on Insta­gram and Pin­ter­est, I am going to out­line 3 ways you can make it hap­pen. And as always, please don’t for­get to share your ideas with me at the end of this post! Images are great for putting a more human face on your busi­ness or brand. While oth­er social media plat­forms shine when it comes to shar­ing and pro­mot­ing writ­ten con­tent, these image-rich sites allow for unprece­dent­ed lev­els of casu­al, rela­tion­al shar­ing. Be proac­tive about shar­ing fun, spon­ta­neous pic­tures. These could be pic­tures of your­self, your dog, your com­pa­ny, or your employ­ees. You could even show­case loy­al cus­tomers by hav­ing a ‘cus­tomer of the week’ board on Pin­ter­est, or share real-time cus­tomer images on Insta­gram so fans feel like they are ‘real­ly there’. 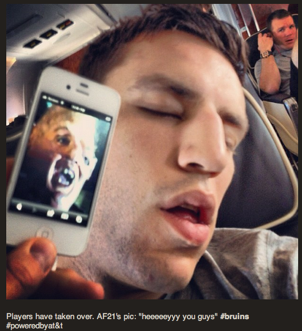 2. just by sim­ply ask­ing fans to share their favorite images. What bet­ter way to invite engage­ment than by incor­po­rat­ing pho­to-shar­ing into a con­test or give­away? 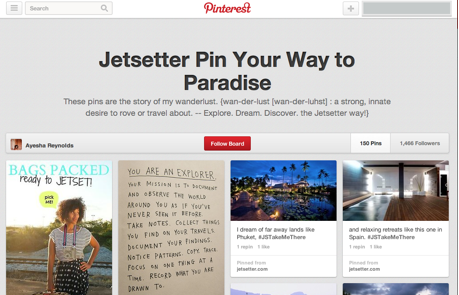 Jet­set­ter, for instance, launched an online scav­enger hunt , ask­ing their fans to pin images from the Jet­set­ter web­site to Pin­ter­est. The result? Not only did the com­pa­ny undoubt­ed­ly receive a huge influx of traf­fic to their site, but their fans cre­at­ed over 800 boards and 16,000 pins. How’s that for user engage­ment? #2: Pho­to-Shar­ing, Just Because They Want to! High-end retail­er Tiffany & Co recent­ly launched a down­load­able Insta­gram fil­ter that allows it’s fol­low­ers to sub­mit their own love pho­tos. They also launched a cam­paign to pho­to­graph real-life love sto­ries in Paris and New York, inspir­ing fans to share their own ‘pho­to-sto­ries’. Both of these sites can be fan­tas­tic for engag­ing with oth­er busi­ness own­ers or blog­gers in your niche or indus­try. Using the prin­ci­ple of ‘I scratch your back, you scratch mine’, shar­ing images from com­pli­men­ta­ry busi­ness­es can not only be a first step to build­ing a mutu­al­ly-ben­e­fi­cial rela­tion­ship, but it can sup­ple­ment your own con­tent beau­ti­ful­ly. For instance, the team at Etsy had the idea to launch a ‘guest pin­ner ‘ pro­gram. 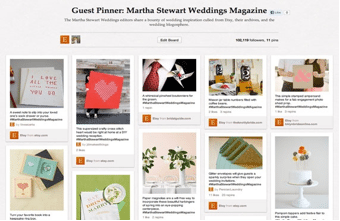 By invit­ing inspi­ra­tional pin­ners to con­tribute to guest boards, they are not only build­ing rela­tion­ships with Etsy store own­ers and experts in the field, but they have a steady stream of unique, inspi­ra­tional con­tent being post­ed to their boards. When using Pin­ter­est and Insta­gram to build rela­tion­ships – whether that’s with poten­tial cus­tomers, influ­en­tial blog­gers, or oth­er busi­ness own­ers – the key is to remem­ber it’s all about ‘give and take’. Invite col­lab­o­ra­tion, shar­ing, and above all, inter­ac­tion. Repin, com­ment, and share when appro­pri­ate, and you’re well on your way to forg­ing new rela­tion­ships and solid­i­fy­ing old ones. What are some cre­ative ways that you’re using Pin­ter­est and Insta­gram for your busi­ness? Would you agree that pic­tures have the poten­tial to cre­ate greater engage­ment and inter­ac­tion? Why or why not?